Guess who is going to speak at Spelman College in May? Yours truly! I AM SUPER EXCITED! It will be my second time speaking at Spelman. Last year, I spoke at the Digital Doyennes event sponsored by Spelman’s Digital Moving Image Salon and the Women in Film & Television Atlanta. So here are the details about my May visit. I will be speaking on a panel with Patricia Cesaire of Black Enterprise, James Anderson of SocialPeople.tv, and Roland Martin of CNN, that will discuss how social media can help women shape their leadership brand at Spelman’s 8th Annual Leadership and Women of Color Conference on May 17. Check out the Pinterest board I created about personal leadership brand (will add more information in April and May). The Leadership and Women of Color Conference begins on May 16 with an opening session on Leading with Purpose and the Legacy of Leadership Awards Dinner. A networking breakfast, opening session with testimonies from the field, and panel discussions, and workshops will be held on May 17. Click here to see the full schedule. Speakers include Dr. Beverly Daniel Tatum, Dr. Jane E. Smith, Tai Beauchamp, Josefina Bonilla, Henna Inam, Angela Fletcher, Katherine Giscombe, Kym A. Harris, Nicole Roberts Jones, Kathleen McGhee-Anderson, Rep. Alisha Thomas Morgan, Deborah Owens, and Andrea Riggs. Click here to register for the conference. 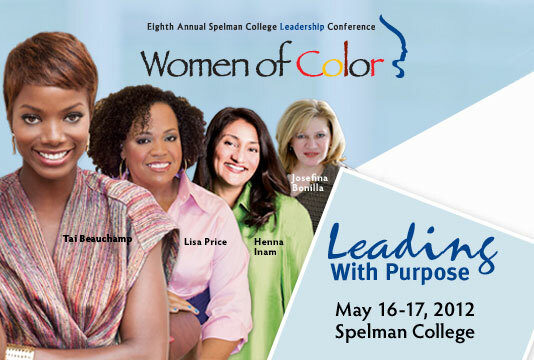 Be sure to follow Spelman and the Conference on Twitter @SpelmanCollege and @SpelmanWOCConf. Can’t wait to see you! This is going to be a great conference. We love Spelman & You! See you in a few weeks. Way to go! Thanks Britton. I am excited too!